Re-Engineering - What would Dennis Do? Caution with re-engineering 6K Td coils for high humidity use. Right... This one always confuses some but essential to know. How do you get a system to work higher than 75% Rh from a 6K evaporator TD out of a standard catalogue? Well before we play with U factors (co-efficient of heat transfer ) with fin spacing etc the premise is fairly straight forward. A larger capacity evaporator on a smaller outdoor system will lower the evaporator TD from 6K. Without going into all the watts at 1K calculations , let me just say that pipe sizing is critical since they will not likely be same either side. If you trying to achieve a high humidity by lowering the evaporator TD , you need to be aware that the TX valve superheat you set will become an issue. For instance a 6K evap TD works on the following typical design. 2.c room temp - 6K = -4. S.E.T (sat evap temp). The TXV superheat can be set to a maximum of 6K as well as it cannot exceed the final room storage temp at the bulb. - 4 S.E.T for a 95% Rh at product storage design temp. This presents a problem for thermostatic expansion valves since they do not like too close a superheat , or they will hunt. This is when electronic EEV is a better idea as it can pulse flow and give you 0.5K variance. A couple of things to consider here. Always check and set your TXV but use caution with setting it. The only real way to assure a controlled evaporator TD is to attach a evaporator pressure regulator to the outlet or find ways to make the load and external environmental factors constant. Consider an EEV as an alternative which will solve your problem ,works more effectively with low indoor load, head pressure and liquid pressure variances. How many have come across oversized air cooled condensers? In this cold weather , all of you. Typically we try to have a design to match ambient and saturated suction temperature (to allow for suction line pressure drop). In this very cold weather , you will be tested if your in the refrigeration business. Low ambient causes conditions that can confuse , so its important to be aware and how to test. Well.... Thermostatic expansion valves work on design pressure drops at nominal conditions , such as design indoor and outdoor temperatures converted to saturated suction and discharge pressure drop across the valve. Over condensing at low ambient has the effect of lowering both head pressure and also subcooling effect. We look for 3 to 5 K subcooling on a system but we could get 2K. As the low ambient increases condenser efficiency it draws the subcooling closer to the saturated condensing temperature. The condenser TD will also be lower making it seem to be quite powerful. Now what do many do.. Well they deem a gas shortage and add refrigerant. The lower head pressure will lower suction pressure and we will likely have a wider evaporator TD and a less filled evaporator. By adding more refrigerant when you do not need it, increases both head pressure and subcooling effect. This will correct the superheat issue and pressure drop across the TX valve but spell death for your system when things warm up outside. You will have head pressure issues and possible evaporator flooding. Now all you need to do is correct the design conditions in low ambient by restricting condenser airflow to see if the TXV superheat and evaporator design temperature improve. If not perhaps a restriction , leak , device malfunction. If it does sort things out then leave it. The times it will be out of whack will not be outweighed by the times it will be working ok. As a guide using Perth ambient and a 10K condenser TD , around 38 to 40.c condensing temperature which you can simulate by restricting airflow across the condenser. Make sure all safety pressure controls are functional and set right first. You can employ head control to fix it too, but remember you fix the compression ratio forever doing that making it consume constant power all year. I have used everything from my jacket to whatever was lying around the site to block the condenser off to test for suspected low charge issues. Its also a good way to set your TXV superheat in low ambients ready for design weather. 2 - More complex electrical interface eg fan delays, heater terminations, drain heaters ,and defrost cycles. 3 - Icing back to the compressor , what to expect and when its not flooding back. Freezer temperatures are based on a minimum room condition of -18.c , this to stabilise ice cream and other products that demand lower conditions. , most things like meat freeze below -2. A Freezer works at 6K coil TD, any lower and we make compression ratio higher and displace less refrigerant per kg/sec. making the compressor less powerful. We also dont need to factor in humidity since below -5.c air psychrometrically has no moisture in it. Vapour entering temperatures to the compressor must be kept as low as possible to increase performance, usually it will enter the compressor at -10 to -8. This vapour energy will still attract moisture from the air being below 0.c , insulate it good but expect the suction line and compressor suction inlet to be an ice block. Never let a block of ice at the compressor put you off. That's a good thing. Electrically , you will need some education on freezer layouts that we cant fully cover here. Fan delays are necessary, they do not engage the fans after defrost until the coil surface temp reaches around -10 as the air in the room at low temperature has a much lower volume m3/kg. If suddenly heated up by a hot coil with fans bringing the cold air in the room across the evaporator, the air will expand its volume rapidly increasing pressure on the side walls of the room. (similar to pneumatic's) . That's why they have those pressure flaps (explosion ports) in the room to the outside in case that happens. You would not the walls to blow out. Freezers are actually quite easy to check , no harder than medium temperature coolrooms. The rock & hard place of condensing units. Efficiency in terms of mass flow rate depends on many things , volumetric efficiency , refrigerant type and operating saturated evaporation / condensing temperatures. Now old school fridgies have always said, Keep the suction pressure high and the head pressure low. This is in reference to to any operating system and simply makes the compression ratio and volumetric efficiency better. Increased subcooling delivers more available volume to an evaporator , yet to get this we risk lowering liquid pressure and expansion devices need that pressure drop to operate. Liquid pumps and/or EEV's solve this problem , not an alternative to a small system let alone cost effective as an option. Floating the head pressure is done all the time, reverse acting high pressure controls or VSD liquid sensing condenser fan controls. Buying a high ambient condensing unit seems to solve many problems , but we risk creating more problems in cooler weather with over-condensing and pressure drop. So most will use fan control to keep the head pressure constant all year by setting the head pressure to the design maximum condensing temperature of the unit. And there in lies the problem... The compression ratio is fixed permanently allowing for no cost savings in cooler weather. While your indoor unit will be happy with the constant pressure drop at design, the power consumption wont change. Using an evaporator pressure regulator for low ambient also causes similar issues. If your installing a medium range condensing unit for an average coolroom or freezer room, do your homework on exactly what maximum ambient you need. Its not 46.c all year and sometimes lesser efficiency is only short term cost ineffectiveness. As a rule, if the indoor load is down , the outdoor can cope with ambient increases over design without too much inefficiency. High ambient condensers are not always needed in Perth. You will have a terrible time trying to set a TX valve on a freezer when its over condensing. Floating the head is always good option when you have cooling in seriously low ambients. Never to correct a high ambient condenser. It might surprise many to in the trade to consider that the little sight glass in this picture might indicate a loss of charge or even perhaps some flow abnormality. In some cases flash gas is typical, especially where the ambient has lowered enough to make any air cooled condenser over efficient. Subcooling lowers closer to saturated condensing temperatures where we have a condenser that becomes a little too powerful with the added benefit of heat rejection from lower air on temperatures. Expansion devices need pressure to function correctly, many can work ok with lower pressure drop as long as they have subcooled liquid available. The problem is that over efficiency leads to lower pressure drop and this in turn can reduce the amount of liquid flow into the evaporator. Superheats can drift higher with less available liquid and we can see the sight glass showing us some flashing where we do not a fully pressurised head of liquid. Yet this does not always mean that the system is suffering from losses of charge. As mentioned on other posts , you can control head pressure but you fix compression ration, fitting liquid pumps on smaller systems is not economically viable and the times they work outside of typical expected pressure drop is limited. Yet this does not stop some people adding gas to a system. While this will fix the issue , the higher head pressure from additional binded up liquid in the condenser will spell disaster on the first hot day. Sight glasses will pressurise clear for many reasons, An overcharge of refrigerant, an undersized orifice in the expansion device, higher than normal ambients and system capacity much higher than the evaporators, such as multi cabinets off a larger condensing unit with much more volume of liquid flow than required. And yet, in a matched capacity system, a sight glass can appear lacking in charge , the superheat will show you that this is not the case. The psychological need to see a clear glass is no reason to add gas to system which does not require more. Many car air-conditioners met their fate with filter/sight glass combo's and those that added charge til they were clear. On a day whee you have 60.c/140F on the dash intake of cars evaporator , an overcharge is quickly demonstrated. It is also important to know that the most effective place to install a sight glass is right before the expansion device, not after a system drier as we all typically see. That is where we need to know it is. The 'U" factor of a coil , any coil is set in stone from the day it is manufactured. Although its capacity index may change depending on the refrigerant type used, its conductivity is finite. The only way we can change a coefficient of heat transfer is to re-design it again. Depending on the material we use, the number of fins, tubes to provide the added surface area contact. Closer spaced fins provide greater temperature difference to lower humidity while the reverse is applied to higher humidity applications. We can change the "temperature-difference" across the coil depending on displaced capacity and increase capacity , but we also need to realise that a coil can only give so much from its constructed design. What we do is either increase area or temperature difference. Fan speed can also play their part , unfortunately at some point the air will bounce off the coil at velocity due to the lack of free area it represents. Manufacturers have been clever in the way they address such issues. For instance air conditioning split systems have increased their capacity for their size not by changing the U factor of a coil design but to increase area by folding the evaporator around the fan adding to available heat absorption ability. Coefficients of heat transfer are predictable and stable for most high,medium and low temperature designs. Freezer rooms use 6K evap TD , not for any humidity since below -5.c psychrometrically there is 0% RH , but rather to reduce issues with compression ratio and volumetric effiiciency. When you know this is the case with many designs in the factory sense , your job is easier and less complicated. re-engineer existing designs to new co-efficients for other applications for specific humidity control. AREA x U factor X TD governs a coils ability to increase or decrease work. The size of the coil for a given kW capacity depends on the volumetric efficiency and overall compression ratio , the U factor is fixed. Most techs only need to know those 3 rules in any system , the industry has designed around them. Most are not too familiar with oil pressure safety devices. They come in two categories. 2 - Factory issue preset models. Oil pressure switches are designed to monitor changes from the working dynamic pressure delivered by oil pumps. Dynamic pressure is the useful pressure that delivers the oil capacity to the valve heads in compressors. Oil pressure switches are beyond simple on their design. They have to take into account the actual changes in pump dynamic pressure. As oil is delivered by force from the crankcase , the oil pressure can be considered as total pressure , where you have both crankcase pressure (suction pressure) and oil dynamic pressure. To be effective the oil pressure switch has to cancel out the suction pressure from the equation and it does this by taking a suction pressure reference into the control on one side. This will cancel out the suction pressure from the total pressure referenced by the oil pump on the other side of the device. All that is left is any changes to dynamic working oil pressure which will set off the time delay systems through heater and bi metal trip systems. What you need to realise is that manufacturers will likely provide preset oil failure devices to their equipment which are set to tolerances to protect their machines. A technician setting independent oil failure differentials is not common these days. if your providing warranty , then you would understand. You will see only a reset button and either capillary or pressure transducer interface to the system. Oil failure is a serious business and one that should never be ignored. Never bypass an oil failure switch for any reasons. Machines that use then are typically rather expensive. Having the right measurement tools and manufacturer data is paramount , in a crisis where we have low temps systems, we may forget this due to urgency to restore service. So why do people insist on complicating what is not complicated? The crankcase pressure regulator valve is so misunderstood and so messed with that are we ever sure they are working right? Any flow control device that limits flow by throttling liquid or suction will always draw attention to itself. This valve is used where compression systems start up with the most accelerated capacity from where they would normally be. Cooling liquids or low temperature systems seem to be the ones that create such issues, and also blast chiller/freezer. The premise is simple. At higher suction temperatures, refrigerant can carry more capacity. In the case of a freezer system, the first warm start is interesting. We have coil temperatures that are increasing suction load by adding extra capacity at higher temperatures before it can attain the normal low temperature saturated conditions. The compressor is technically oversized and the suction volume both highly superheated and high capacity. The compressor piston which at low temp design is larger or designed to carry greater swept volume at lower pressure drop becomes super effective at higher saturated conditions. The compressor is too powerful. Increased displacement both with superheated gas and increased volume will add to the compressor motors current. The CPR valve is set to allow maximum flow at design full load amps without overloading the compressor motor. Now while this device is set by compressor amps and very clever one must note that throttling the suction load decreases available evaporator capacity. In the initial pull down the timeframe to achieve design saturated conditions will be increased due to vapour extraction capacity reductions but this is offset by the fact that the motor wont overload on amps. 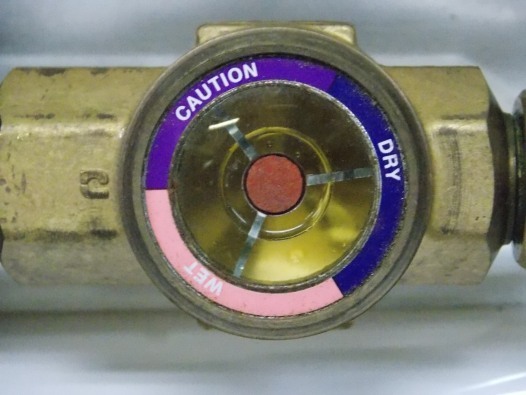 As such messing with this valve during no load conditions is a bad idea and realistically it can only be set at the start up of a new system when cabinet temperatures are extreme. There should be no more than 1K pressure drop across the valve at design temperatures. If more it may be sticking. So don't mess with them unless you have to. They are set up from the start and you cannot alter them at normal load. Malfunctioning CPR valves act like surrogate evaporator pressure regulators and alter suction saturation temperatures when in fault. Set them by compressor maximum FLA only ok? 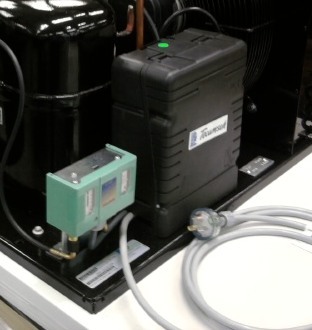 2- They can be used on multi-temp systems to have both medium and low temperature availiable off one compressor. 3 - They are effective when used with smaller evaporator temperature differences , eg 2K rather than typical 6K design for high humidity applications. However my point to this story is that you should always remember that an EPR can also create secondary issues if system designs do not accomodate them right. Firstly , they will throttle flow on start up and reduce initial capacity due to lack of displacement under high load conditions. This is no where near as problematic as it sounds. All systems require pull down and they will keep evaporator pressure up a little at the start rather than a compressor be able to extract vapour at velocity without it. Small stuff really since it is short lived. The biggest issue is what happens on the other side of the valve on the compressor suction side. While your design pressure/temperature is being maintained, the suction pressure could be a lot lower due to the compressor capacity and as such compression ratio's go up, volumetric efficiency goes down and power consumption goes up. So , keep it simple, always consider unloading a system that may have multiple evaporators off one compressor or make sure that the compressor is matched as close to the capacity for a one on one system using an EPR valve. The flipside to this is that the EPR valve will correct all problems of humidity control in varying ambients to the condenser or liquid flow reduction to the expansion device. This is why I really like them. Keep the EPR installed as close to the evaporator outlet as possible and set your superheat as you would normally, many think EPR valve's change the rules on superheat. no they dont , they fix P2 (evap pressure) constantly so a TX valve is consistent with pressure drop most times. (access needed) and all set outside the room. All techs have to do is make sure that the sensors are reading in calibration occasionally. Thermostatic expansion valves cant work too well with low superheat and liquid pressure but EEV's can. Result = lower compression ratio's , more energy savings and greater nett refrigeration effect for our power input. See pulse control EEV from danfoss product animation for AKV 10 series which can be used with external logic PWM inputs or by their own control loops using duty cycle. a plug and play package. valve closed, preventing floodback to the refrigeration plant. in energy savings for the end user. time operating conditions, alarms, messages). second level menu (MOP, LOP etc). power back-up reliability. The Ultracap will discharge when power is lost driving the EEV closed. Did you know that products stored at below freezing point temperatures require less energy to lower and maintain temperature. BS you say?? ..... And perhaps most think that freezer systems are more energy hungry and storing products at minus temperatures requires a lot of work. Well the only true fact is that when we talk about latent heat of fusion (freezing) liquid to solid , this part uses the most amount of energy. The people that have to freeze products commercially(eg ,peas) are the ones who are paying the most energy bills. You can see why the supermarkets do not want to freeze their own products. It's much cheaper to maintain them at low temperature. They can have far smaller systems to maintain low temperatures without the added energy needed to freeze. Changing states is where all the energy is needed , such as vaporisation or fusion. Specific heats of products are far less below their freezing point than above, so realistically medium temperature systems have much harder work but enjoy better cooing efficiency's to do so. Products with a high water content demand more energy per degree for transition to design storage temperatures. This drops away to almost half that when frozen. Freezers maintain a -18.c/ -0.4>F Temperature to stabilise ice cream but this temperature is not needed for everything. In fact where a beef or lamb remains frozen at -1.7.c/ 28.94.F , the need to go lower to that temperature might be waste of energy. If you can design a freezer to much higher storage temperatures eg -10 , you can use much smaller equipment and consume less power. Image from Buffalo Trident medium temperature series evaporators , based on 2.c / 35.6 and 6K evaporator TD, this provides 75% RH which is an aggregate of mid range humidity needs. While not all products like this humidity , it is based on turnover of room products such as in hospitality and restaurants. You can re-design humidity by converting design watts at 1K TD to get lower TD needs to re-engineer the selections for higher RH% In the case of a freezer room, humidity does not matter. .
Freezers have 0% RH below temperatures of -5.c/23.F and are based on a -18.c/-0.4F storage temperature to stabilise ice cream. ​Reducing air change load by Anti-Room Design. 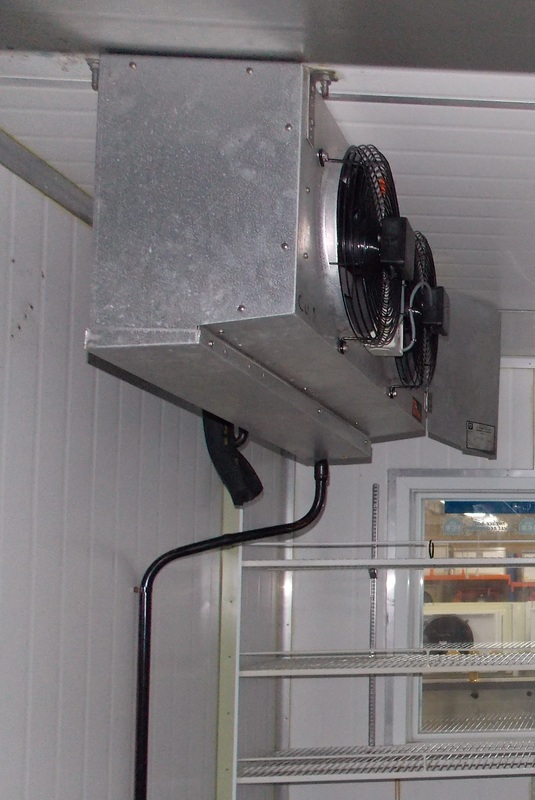 This method of controlling air change load by using a coolroom as an anti-room to access the freezer is nothing new. It has its advantages being that there is far less load shock to the freezer room with 2.c storage temperatures. Many have used this design when using the common system control arrangement. It also makes for a cost effective room design. 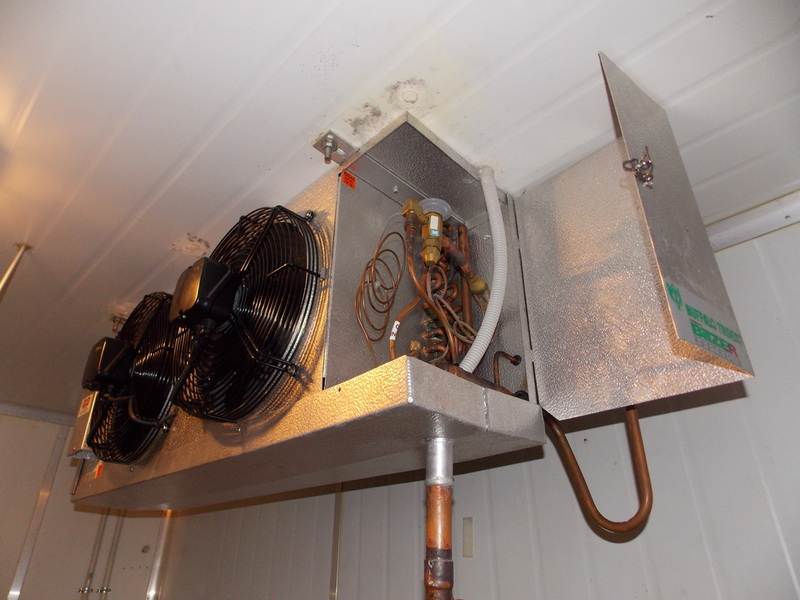 Typically we see a single condensing unit serving both refrigerator and freezer with an EPR valve fitted to the medium temperature coolroom system. The anti-room design ensures load reductions. It is also used on single system control and in some cases is seen in use with forensic rooms , they need to access freezers less often than say hospitality industries. The cons to such a design is that you effectively increase the air change in the coolroom since you have to access it to get to the freezer room. Yet with lesser enthalpy gains to the coolroom at its design temperature in comparison to the freezer room , still a good idea. If used in hospitality arrangements such as a commercial kitchen, the freezer room typically has less air change per day in compared to the coolroom which would be more accessed. One way to increase effective savings is to employ the use of more efficient short term storage such a chest or upright freezer of smaller capacity outside the coolrooms which can house more needed products frozen for easy access. This leaves the freezer to just be long term storage . This way refilling can occur in the cool of the morning before preparation or by delivery. Hydrocarbon freezers offer good savings and the added air change there reduces the freezer systems loading for smaller items , this method can also be used for separate sytem designs too. A 500 to 750 litre chest freezer or upright freezer on R600a can really make a difference to excessive use. Amazing how well the introduction of the superchiller has made service of beer and beer products more efficient. High refrigerant volume investment per tank. Wastage of first pours due to heat in the lines to the tap and the tap itself requiring to be cooled. Of course when beer was cheaper the publicans did not care too much and some wastage was expected, the old joke was that the beer pours that went heady were destined for the fish and chips beer batter. Nowadays with more price per litre and specialised craft beer places, wastage is not an option. The superchillers advantage was using glycol which was larger in thermal mass storage of low temperature acting as a flooded system. Where the glycol is the secondary refrigerant. The glycols are typically food grade in case of line penetration by misadventure. 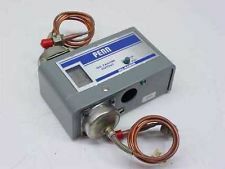 The introduction of the "Python" ensured that temperature the between coolroom and the taps was kept at low temperature while in stasis of no use. The tap itself has the primary heat rejected before the pour as close to beer temperatures as possible. machines can also run overnight in the cooler weather and use less power recovering the tanks. The python required a separate cooling line of glycol to be run with all the other beer lines from the coolroom and also through the beer taps like a reticulated network. Low temperature python lines running at temperatures below 0.c and not usually more than -2.c can allow the kegs to have the gas charge pressure removed overnight preventing further over carbonation of the product while in statical cooling. The beer remaining in the lines can keep its carbonised charge overnight for at least 24 hrs. This ensures no wastage and a good product on the next pour. Of course the icy python is an option and many people simply keep the lines at 1 to 2.c which gives only a sweating appearance at the taps. Some beers also cannot be chilled too low due to a much lower alcohol content. 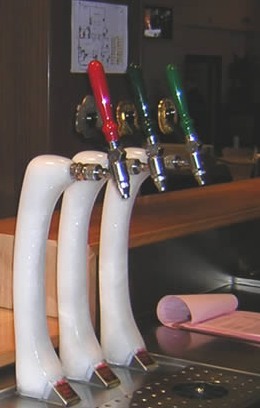 The premise of the icy beer tap is a visual selling point as well, and many are attracted to it due to the appealing thought of a cold one. Needless to say, not much goes wrong with a superchiller, it has very few parts and some pumps. While there are obvious heat gains at the taps , this is all part of the design. Like coffee suppliers with machines , most brewery's take care of their own beer and beverage control systems where they are more exclusive or demand certain controlling parameters, such as gas charge type, pressure and or temperature. Festive seasons are always great but Australians and and many other hotter continents need to be careful with food handling, preparation and storage during the festive seasons (and any other time too) Its the job of a Refrigeration Technician to make sure the cool rooms and freezer rooms are working to safe temperatures. (oysters,fish mussels etc) PS watch out for cooked rice too!! Now bacteria loves , moisture, oxygen and light as well as heat but many can grow without it and even in refrigerated temperatures. Cheese and dips should be kept out of sunlight and in ice bed trays when serving outside or even indoors. (suggested).Kept in the fridge until needed is better. Salads do not always attract growth but they should be well washed and if any salad creams or other dairy, proteins are added , then all care should taken. Commercial dishwasher tanks are kept heated when un-used at 60.c to prevent growth in the water, the rinse cycle is around 87.c to psychrometrically aid drying but also as a sterlisation feature. "keep warm function" setting on the oven , slow cooker dial that never seems to show a temperature, its set for that need. Powdered milk , including the muscle type protein shakes are safe when dry but when re-constituted are at the same risk of bacterial growth as normal milk , so make sure that is stored well too in the safe zone. Frozen foods suspend bacterial growth but it will re-activate when thawed. Keep out of the danger zone of temperatures and enjoy yourself to the max this festive season and new year. There are many sites and youtube videos for food safety awareness. Im not the total food expert but I have worked in commercial catering repairing equipment products and we should all be aware of the little chart below in our trade and our life. May 2016 bring you more wisdom and perhaps a few more beers. Interesting many shy away from fitting these during a large commercial new installation or a compressor fusion. And yet they are the best solution to a bad problem, offering the most economical way of cleaning up a system while in operation. I think everyone fits liquid line filters to refrigeration systems, and yet we don't see them on Air Conditioning systems much. Is this because an air conditioner is less likely to suffer moisture because it works at saturation temperatures above 0.c? It can also be a cost vs system replacement too. Refrigeration systems are an alchemists dream with all sorts of sorcery going on. Metals under heat and pressure combined with refrigerants containing chemicals that can mix with air and moisture to break down into nasty acids. Oils that carry these acids happily around and oils that also are very hygroscopic in nature. These acids lead to more destruction of sensitive parts such as winding lamination's and contaminate everything else. The fact is that heat and pressure are catalysts for reactions. Keeping a system free of moisture and air or other non-condensable gases important. Keeping pipes clean also a must. And then making sure we do not overheat our system, as that also increases the potential for acid formation , as any components that are elastomer in construction can leach out moisture under extreme heat. Once a system is contaminated the only solution is to remove the acids and simply changing the oil does not do that. Liquid and suction filters do mostly the same job but the suction filter can be fitted with a HH grade charcoal filter which will purify the oil prior to compressor entry. Some are equipped with in/out test points to check for pressure drop when they obstruct flow from saturation. Smaller systems even salad bars, cake coolers, bottle/glass cabinet can have a compact suction filter fitted. The filter can be removed from small systems after a period of time but larger system simply change cores and keep the filtration going as a standard. These devices also ensure that a new system installation has all the advantages from the start. They are easy to fit to most refrigeration systems as a safeguard for new commission or as clean up tool for compressor fusion. Unfortunately they are problematic to install to a VRV/VRF system or even a simple ducted unit as heat pump offers some issues with directional flow. They need to be point of origin at the suction inlet to the compressor. Some have also complained of lack of space to fit them in the condensing unit. Don't underestimate their use, they are excellent for what they do. Your pressure , temperature chart or your gauge temperatures for any refrigerant to its pressure. Evaporation and Condensing are relative to adding or taking away heat. The gauges and the charts are only relative to saturation temperatures. Take your saturation reading and it becomes the centre axis. What you do with heat controls the process. The processes of change are reciprocal from a subcooled liquid to a superheated vapour or back again. keep it simple. Think about why you must insulate liquid lines when passing though roof spaces at 55 .c when in a subcooled state. our high side is at risk of flashing off. Think about why manufacturers require liquid lines to be insulated in split systems when they expand the gas from the outdoor unit from an EEV or capillary. Our low side is protected here in Australia from re-subcooling from expansion but at major risk of excessive superheating. Our refrigerant behaves according to how we add or remove heat. Water is a subcooled liquid. At 101.325 kpa atmospheric pressure , water boils at 100.c. Anything less than that in the same pressure is subcooled. So maybe next time you want a scotch and water at the pub , ask for a scotch and subcooled liquiid. A constant speed compressor (not inverter) usually when designed correctly subcools at 3 to 5k below the saturated condensing temperature. So at 45.c saturated condensing temperature design , you have around 40.c leaving condenser temperature. Well too low subcooling means the condenser is too efficient and can bring the gas temperature closer to the ambient design. This can occur with oversized condensers, shortage of refrigerant or too low an ambient for the condenser design. The result is lower evaporator pressure and less ability to push gas through an expansion device. If you have a gas shortage the condenser becomes technically oversized for the system capacity. High subcooling means that the saturated condensing temperature is much higher than the leaving condenser temperature. Now while this sounds better it is a real worry. You lose condenser space to do what is needed , like de-superheat from compression and reduce the overall volume of a condenser. This can occur with an overcharge of refrigerant , mixed gases such as wrong refrigerants mixing, non condensables such as air or nitrogen. 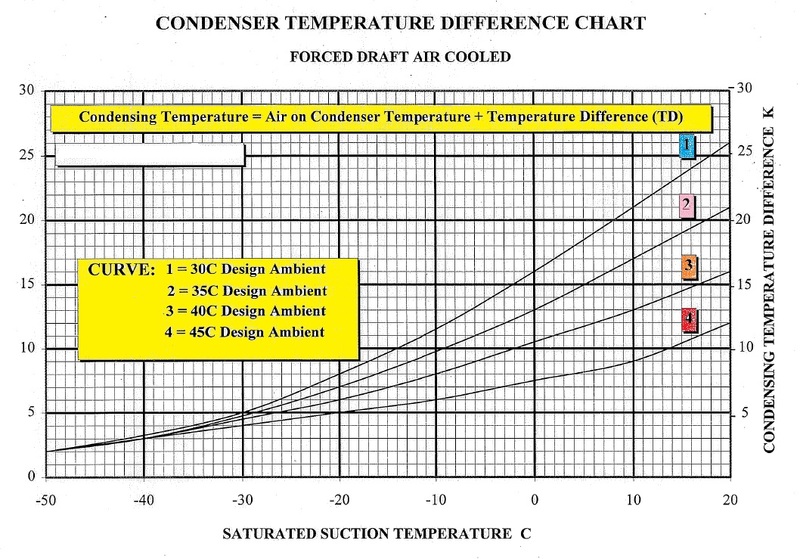 An undersized condenser will subcool but have a much higher SCT. 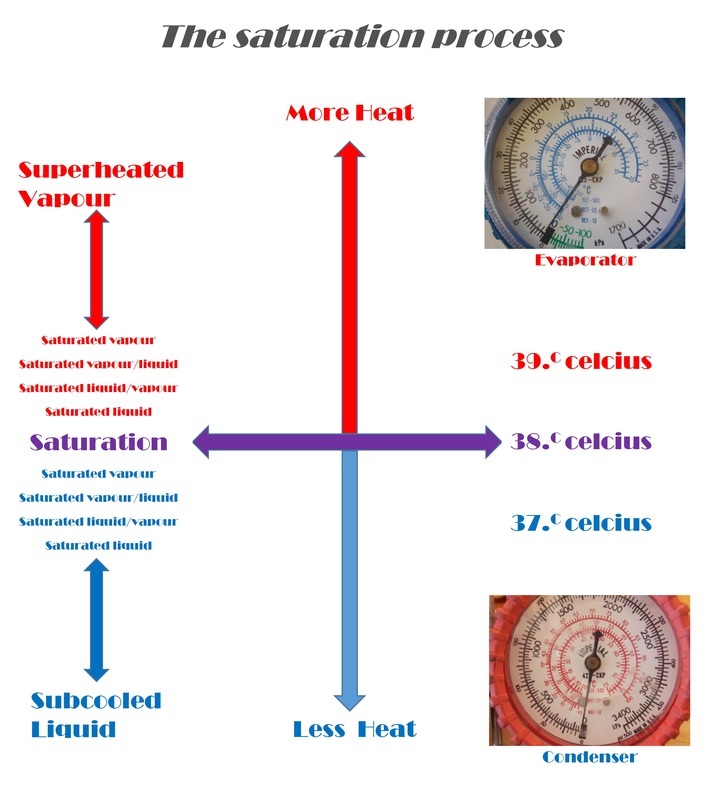 The result might be more velocity of flow but lesser ability to bring saturated evaporator temperatures down as the nett evaporator capacity is diminished by higher enthalpy change from high to low. Lower subcooling means more refrigerant , lesser enthalpy change and increased evaporator capacity. This is a reason we do not insulate liquid lines in refrigerated applications. A constant speed system working at design ambient will be charged at around 3 to 5k subcooling. This means the condenser has the right volumes of surface area being used for removal of heat of compression, latent and subcooling energy's. Keeping the balance of liquid subcooling to condenser surface area is a must. High subcooling = less efficient system , overcharged, mixed gases. Many set pressure controls to the basics, in particular the low pressure control. It seems most are happy with cutting out just above atmospheric pressure (0 kpa Gauge). Of course when you do set this , you need to be mindful about whether that is a good idea or not. And many will say "hang on" been doing that for years. Pumping down works when its fully controlled, as in controlled with sensible devices. 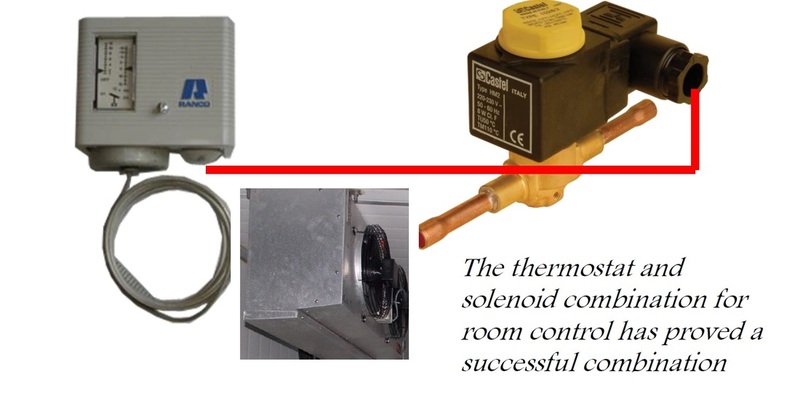 The industry has used a thermostat and solenoid for room control very successfully over the years. The idea being at temperature , the thermostat switches off a solenoid valve to the indoor unit, pumps down and stops on low pressure, set to just above atmospheric. The advantages are as follows. ** The outdoor unit can be on a dual supply for the power , which means it does not need to be integrated to the indoor electrics as the pressure control to the outdoor is local. Very good when you have long pipe runs and differing electrical MSSB. This not the preferred option for power supply but possible. ** The refrigerant can be recovered from the stable room evaporator and used where it is needed, such as in multi systems reducing the system load. 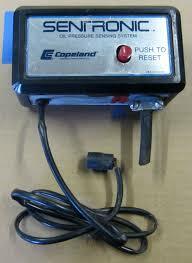 ** It allows for capture in emergency pump down systems. ** Short cycling due to residual refrigerant heating in the coil on the off cycle with a single system is never going to happen. A room which has critical high humidity could be in real trouble during a partial gas loss or restriction of gas. As the evaporator pressure lowers due to lack of gas , superheat increases and evaporator TD increases to the air temp on it. This will regardless of design, lower the RH% with whatever available refrigerant is still flowing in the coil. The pressure control wont cut it out as it is set for above atmospheric. The result is some produce in the room such as lettuce etc, will risk drying out. While your coil wont be operating at full capacity , it still has proportionate capacity but now at incorrect conditions. To set a practical cut out pressure , you need to know coil operating design , and of course fitting EPR's might change those rules a bit too. Here is an example...... for medium temperature designs. Now you need your system to run at -4.c so cut it out , allowing for pressure changes with lower outdoor ambient, set at say -12.C which might be a safer bet and less problematic with room humidity. Set your outdoor LP to an equivalent pressure of -12 S.E.T on the system gas type. (suggestion only please) and not at above 0Kpa Gauge which is very cold for most gases. Of course its your call not , mine on how you set them. 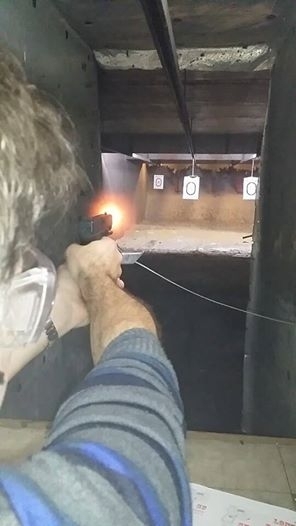 Whats firing off a 9mm hollow point in a Glock17 got to do with anything? Well... ballistics looks at speed and the behavior of a bullet when fired from a gun at a target. co-efficient of heat transfer. This increases the heat rejection ability. 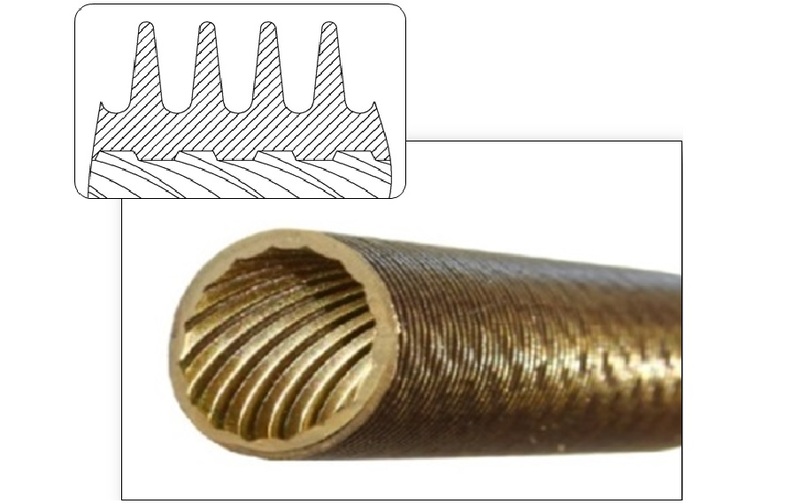 This is why condensers are "rifle tubed" and made of very thin material , grooved to improve thermal conductivity to the surface area of the coppers primary area. Cut open condenser tubing next time you have some scrap. You will see the internal grooving and the very thin design.